As indicated by its name, both functions are useful for embedding the related object forms into the main form. All basic actions like Editing, adding, and deleting on embedded relation forms are already handled by propel. So, you don’t have to write a single line of code. Well, let us take an example from my previous article. I assume you’ve initiated the product module. Open ProductForm.class.php and ProductPhotoForm.class.php files, add the code below to the configure() function. 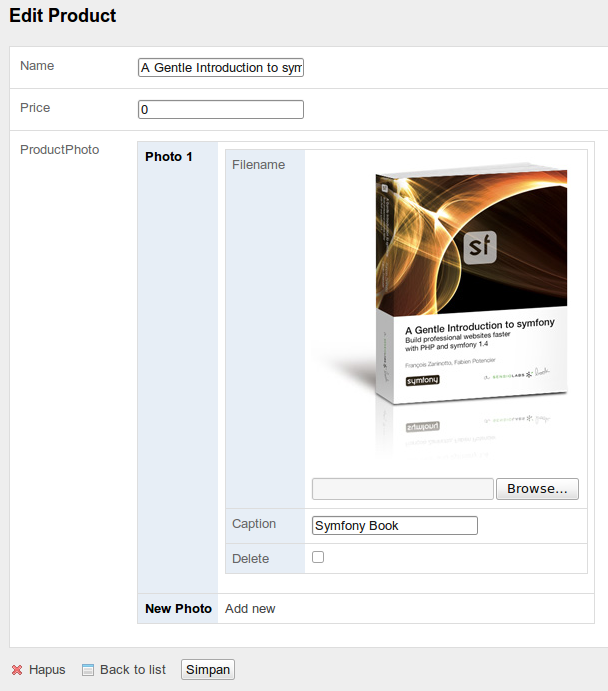 Now, try to create a new product, then click on the Add New link. Have a look at picture below. If you notice, there is one missing feature there, yes .. an action to delete the embedded relation forms. By default, this feature exist when you are editing an object, as shown by the picture above. How to add the delete feature while we are creating a new object? Because the feature is intended for embedded relation forms, open ProductPhotoForm.class.php, add the code below to the configure function. Refresh your browser, the delete checkbox now appears as we expected. In the code above, we have set the parent_level value by 5 and its value depends on the structure of your form (see the illustration below). What is the parent_level? parent_level is The number of times parentNode must be called to reach the parent. In our case, the parent is the span tag (span (5) -> table (4) -> tbody (3) -> tr (2) -> td (1)), not the div tag, because the div tag is the container for all additional embedded relation forms. One thing to notice, the delete action in the new mode is different from that in the edit mode. 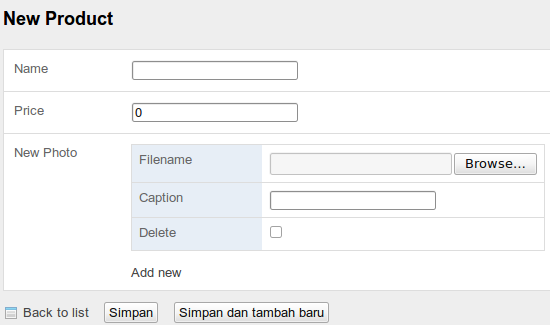 In the edit mode, when the user place a check on one of the embedded relation forms, then the user click one of submit buttons, the related object will be marked as deleted when it is being validated. Where as in the new mode, the related object does not exist yet and will be treated as a new object, so it will fail while it is being validated. To resolve the issue above, before entering the validation process, we have to get rid off the marked embedded relation form(s) from the main form. If you are still using propel 1.4, I recommend you to upgrade to propel 1.5. It is backwards compatible with propel 1.4 and offer many interesting features. For more information, you can read here. Thanks so much for this tip. I noticed that this seems to only work if the product is new. 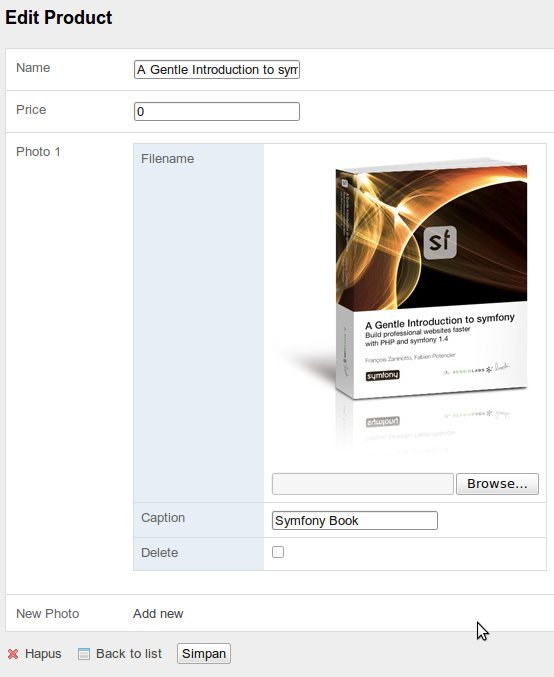 If you try to cancel adding a photo for an existing product, you’ll still get the error message. Also, this appears to only work for MergeRelation, not EmbedRelation. Any idea why? I’ve updated my article by removing the isNew() in the doBind function. 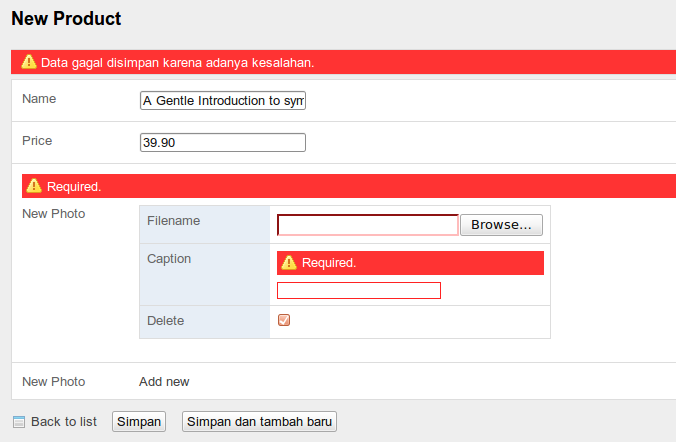 I havent’ tried if using embedRelation. Thanks you for the correction. 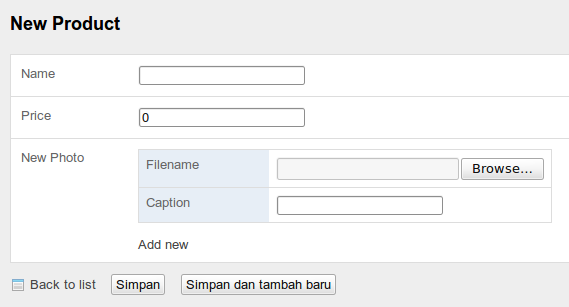 I found that there is an issue (atleast when embeding forms) if you add 2 new photo forms, delete 1rst added and fill the second. while( array_key_exists($name . $i, … want find subrec2 (it will never reach $i++). So if make the same change to your bind it will work also. Your posts are very-very helpful! Look simple and great solution..